An advanced data analysis solution. 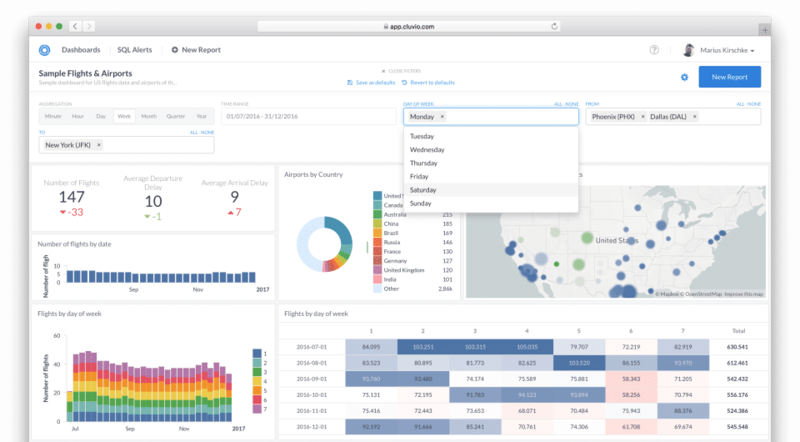 Cluvio is a data analytics platform suitable for small and medium business. With the use of time-based and custom filters, reports can be easily categorized in the dashboards. This dashboard can be shared with multiple users through link. Cluvio supports integration with all SQL databases and provides an advanced data analysis. It allows you to filter results based on your preferred parameters and also supports sharing of dashboard. In addition, you can run R script on SQL query in order to maximize the efficiency of analysis. This cloud-based application enables effective security protocols to prevent unauthorized access to your data. How much does Cluvio cost ? 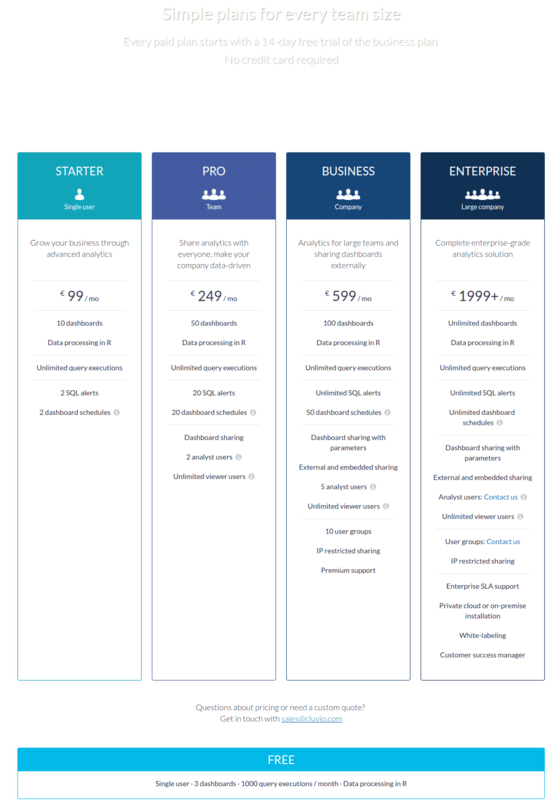 The pricing for Cluvio starts at $122.5 per month. Cluvio has 4 different plans such as - Starter at $122.5 per month, Pro at $308.11 per month, Business at $741.8 per month and Enterprise at $2473.5 per month. Cluvio also offers a Free Plan with limited features. "Fastest way to get insights from data"
Quick and easy to set up, great customer support. Extremely easy to share dashboards with team. Some advance charting options are still not present. We are an app-based company and are using Cluvio to measure key KPIs and run different analysis to understand user behaviour. 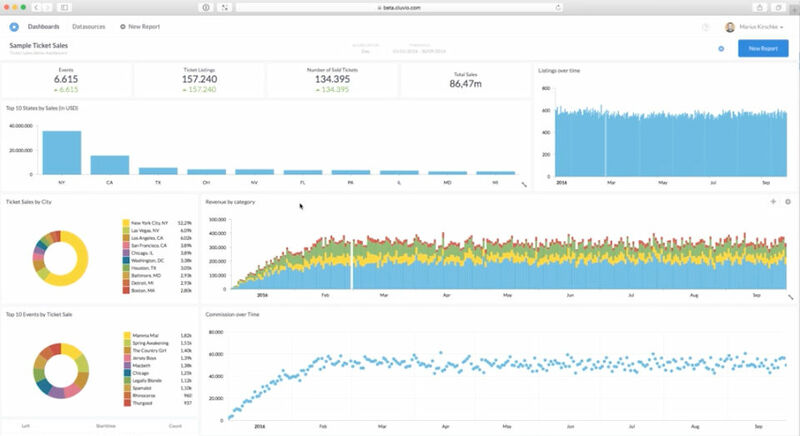 This has helped us reduce uninstalls by removing low performing channels and almost gives us immediate insight into all the experiments we are running. Pros: Really beautiful charts, easy to build and has an R console! With their business plan it's really easy to build bespoke dashboards for specific teams in the business, and I can even share dashboards with external contacts with their links feature. Customer support has been second to none. Cluvio have on several occasions gotten on a call with me to talk through the product, and their turnaround time is outstanding. Cluvio has made a huge impact on our reporting of all our analytics! Cons: Nothing really to add here, it's fantastic! Pros: Very easy to use out-of-the-box. Very nice and flexible graphics. Cons: Needs better ways of managing scripts. Version controlling and back-ups would give me more confidence to use the platform. 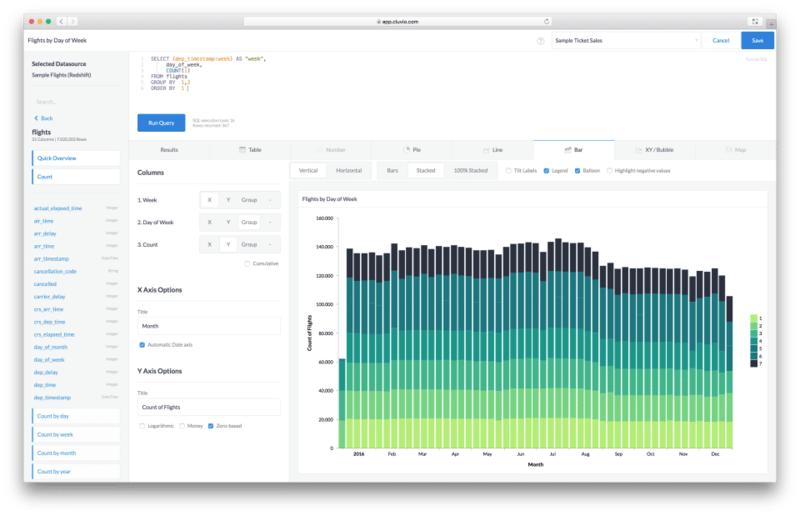 Pricing could be cheaper to allow more developers to create their own dashboards. Overall: Overall, a brilliant product if a little expensive. Could be adopted more widely is more users could interact to develop their own dashboards. Pros: Ease of use. 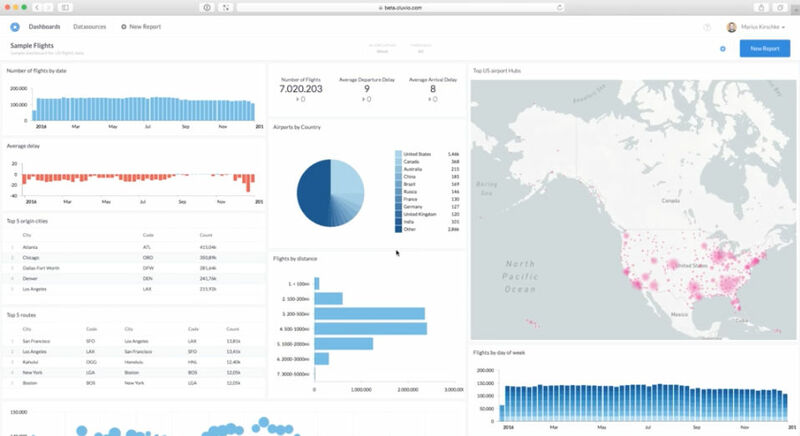 It was super easy to connect to our Snowflake data warehouse and start making sense of our billions of data points. The price is right, as well, with other companies trying to charge 10s of thousands more for more limited feature sets. 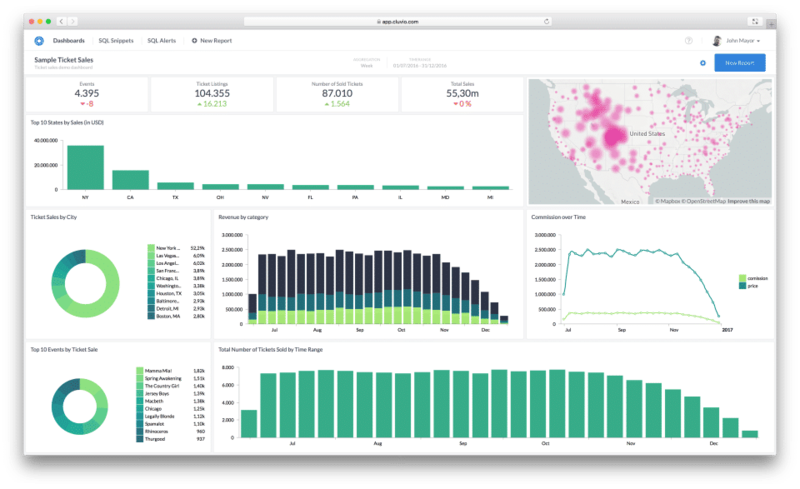 Overall: We were able to replace our home-grown reporting tools with some Cluvio-built dashboards for a fraction of the engineering cost and nothing to maintain. Additionally, the insights we are able to give our clients is bringing us even more business! 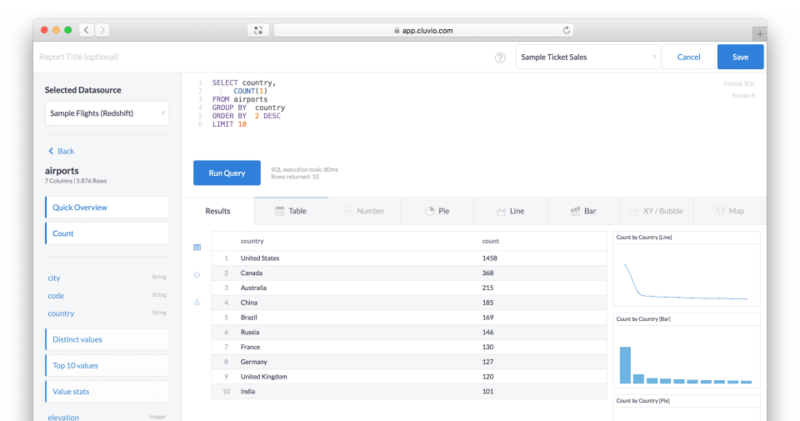 Pros: For someone who has never used SQL before, this software made it very easy for me to start querying databases and extracting data. I haven't created any reports from scratch yet myself but I have edited reports created by others and I found the process intuitive and easy to pick. Cons: The editing of reports seemed slow at times but I'm not sure was this due to the overall size of the data source that I was trying to access or something else. Also there is a bug that hasn't been fixed where the PDF files in the automatically scheduled have a blank map where the map is fine in the body of the email itself. Overall: We're using Cluvio to visualize and analyze data collected by an app on mobile devices. Pros: I liked the ease of use and the possibility to use different data source. Which is the best dashboard software in terms of data security? Cluvio and Alteryx are the best software in terms of security.